Rounding off this trio of Aldi Specially Selected coffees, we leave the African continent and head for Indonesia. Java is apparently the world’s most populous island, despite being considerably smaller than the islands in the next two spots (Honshu in Japan, and Great Britain). And yet, they manage to fit enough coffee plantations in to help push Indonesia to the fourth largest coffee producer globally. 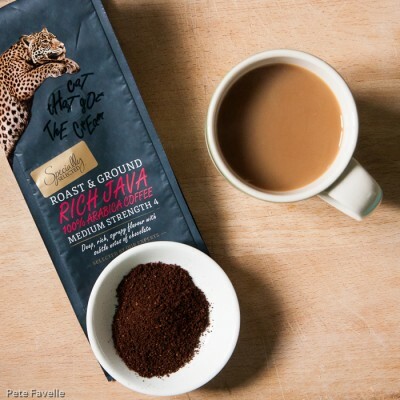 Aldi Specially Selected Rich Java Coffee is medium dark roasted coffee, labelled as ‘medium strength’ although I tend to think of Java as a stronger coffee than that. The grounds are warm and rich smelling; toffee and milk chocolate, with singed wood lurking in the background. There’s a dark fruit aspect too, but without acidity – blackberries perhaps. Brewed, the woody aromas come through stronger, along with a slightly earthy character. In the mouth there’s a decent body, but the flavours are a little muted. There is some soft chocolate notes, and a little sweetness blending with a nice, dry bitterness but it lacks the punch that the nose suggests. Nothing to really make this one stand out, sadly – 2.5 stars.